Ожидается поступление на склад г.Москва: 24 мая 2019 г. — 1 000 шт. от 250 шт. — 68.10 руб. Добавить в корзину 1 шт. на сумму 71 руб. 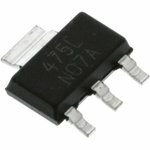 The Texas Instruments LM117/LM317 series of adjustable three-terminal positive voltage regulators are available with current ratings of 0.1, 0.5 and 1.5A. Output voltage range is from 1.25 V to 37 V and is set by two external resistors. These robust and reliable devices incorporate current limiting, thermal overload protection, and safe operating area protection.